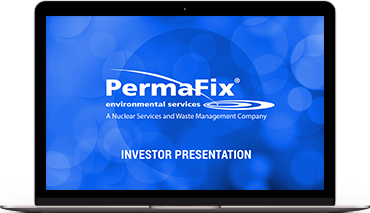 Perma-Fix Environmental Services, Inc. is a nuclear services company and leading provider of nuclear waste management services. The Company's nuclear waste services include management and treatment of radioactive and mixed waste for hospitals, research labs and institutions, federal agencies, including the Department of Energy ("DOE"), the Department of Defense ("DoD"), and the commercial nuclear industry. The Company's nuclear services group provides project management, waste management, environmental restoration, decontamination and decommissioning, new build construction, and radiological protection, safety and industrial hygiene capability to our clients. The Company operates four nuclear waste treatment facilities and provides nuclear services at DOE, DoD, and commercial facilities, nationwide.